Title: KEEPSAKE D'HISTOIRE NATURELLE. DESCRIPTION DES OISEAUX suivie d'un exposé de l'art de les préparer et de les conserver. 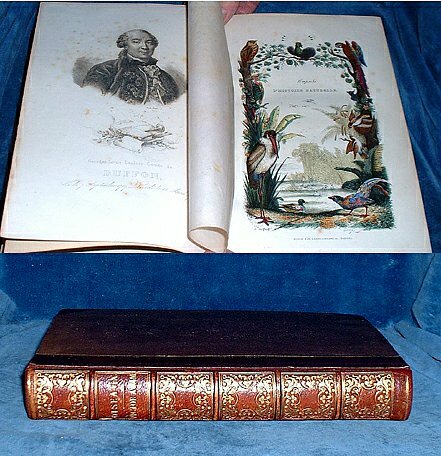 Description: Paris, Bazouge-Pigoreau /Tyas London 1838 Hand coloured plates heightened with gum (38 with 154 birds shown in groups from 2-6 per plate) by Victor Adam +uncoloured frontis portrait of Buffon +pretty hand coloured engraved titlepage by Pauquet /Rouget sc.. Small quarto plum roan spine extra gilt compartments & faux bands with cloth sides (tips a bit worn/rebacked with old spine relaid/cloth rubbed). Portrait Frontis +hand coloured titlepage +printed titlepage +Portrait +xxiii p blank +312pp. Text pages with some foxing, more so to first & last pages. Plates mostly clean & white but a few have pale edge foxing. Two tissue guards torn, one at p17 lost. The plates are all beautifully hand coloured and heightened with gum.